Geothermal heat pump systems are invented to improve the efficiency of the air-to-air heat pump system. The air-to-air heat pump operates well when the outside ambient temperature is above 0°C. Below this freezing point, the system's efficiency drops rapidly. In order to cater for this drop in efficiency, peripheral components such as auxiliary heater is installed indoor to boost the heating capacity of the unit. This auxiliary heater is turned on whenever the capacity to heat up the room drops due to the freezing of outdoor coil when outdoor temperature goes below 0°C. The study by experts show that our earth is a huge mass with stable temperature. The temperature of the earth is about 50°F or 10°C at about 4-6 feet below the ground. Coils that carry the liquid refrigerant are buried underneath the earth below the frost line which is usually about 4-6 feet deep. The coils can be buried vertically or horizontally underneath your property and are connected to the heat pump systems in the house. This ground coil may also be placed in the bottom of a lake or a pond. The coil or also known as the loop is usually made of highly durable high-density polyethylene plastic material. The coil can also be made using copper piping. In places where the temperature drops below freezing point, anti-freeze solution is added to the liquid refrigerant to prevent it from freezing and thus breaks the coils. The anti-freeze solution can be glycols or alcohol which are relatively safe and non-corrosive. During winter, the system runs heating cycle where the liquid refrigerant flows in the coil which is buried underneath the ground. It starts to boil and absorbs heat from the ground that surrounds the coil. The vaporized refrigerant is then channeled to the compressor where it is compressed and discharged into the indoor coil (which now acts as a condenser). The condenser changes the vaporized refrigerant to liquid form and provide heat to the air in the room. This liquid refrigerant then returns to the ground coil and the cycle is repeated. During summer, the system runs cooling cycle which is done by the use of a 4-way valve. The 4-way valve causes the refrigerant to flow in the reverse direction causing the indoor coil to become an evaporator and the ground coil a condenser. The direction of the flow to the compressor remains the same. The ground absorbs the heat from the vaporized refrigerant and the evaporator provides cooling to the room. A ground loop heat exchanger that will be placed on a pond for geothermal HP application. Life Expectancy of the system can easily go up to 25-30 years. Many manufacturers of ground coils provide warranty up to 50 years that use high-density polyethylene material. Lower Cost in operation and maintenance is another plus factor. No maintenance is required for the coil that is buried underground. Utility bill can do down by 30%-40% compared to the conventional systems. Noise from the outdoor is eliminated. The air-to-air heat pump system uses a propeller fan to cool the outdoor unit thus creating noisy environment in the neighbourhood. 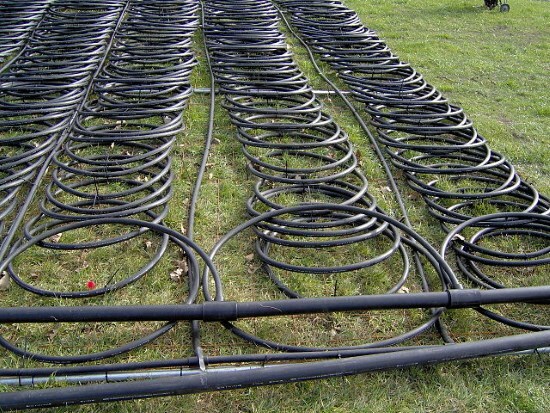 Efficiency of a geothermal heat pump is better compared to the conventional system. In heating mode, the savings in electricity can go up to 70% compared to conventional heating system. Savings of up to 60% have been recorded for cooling mode. Clean Energy is another aspect of this system in which there is no combustion of natural gas or coal in the system. Hence this is the direction that all who are into the protection of our environment should pursue. Hot water can also be produced for domestic use besides heating or cooling the space of the building. International Ground Source Heat Pump Association (IGSHPA) offers many training courses in this field. Accredited Installer Workshops, Certified GeoExchange Designer, Certified Geothermal Inspector Workshops and Certified Residential Geothermal Designer are some of the courses that are offered throughout the year. See more here.